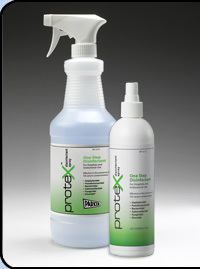 PROTEX™ DISINFECTANT SPRAY : Balego & Associates Inc. - BalegoOnline.org, Providing the Products You Want and the Services You Need Since 1984. A powerful one-step disinfectant effective against a broad spectrum of pathogens, including MRSA, HIV, Staph and many others. Useful in disinfecting ultrasound transducers, probes, mammography compressor plates and other hard nonporous, non-surgical surfaces. There currently are 724 guests online.